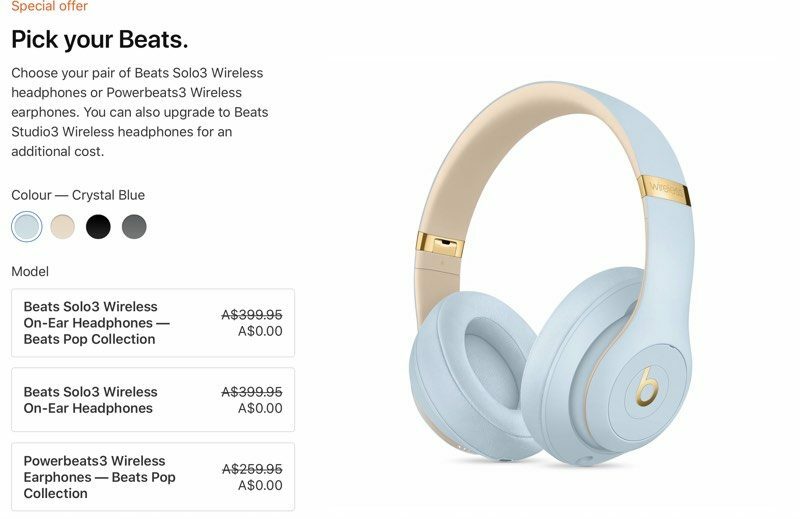 Apple today launched its annual Back to University promotion in Australia,New Zealand, and Brazil, offering students and teachers a free pair of Beats Solo3 Wireless Headphones or Powerbeats3 Wireless Earphones with the purchase of a Mac or an iPad Pro. 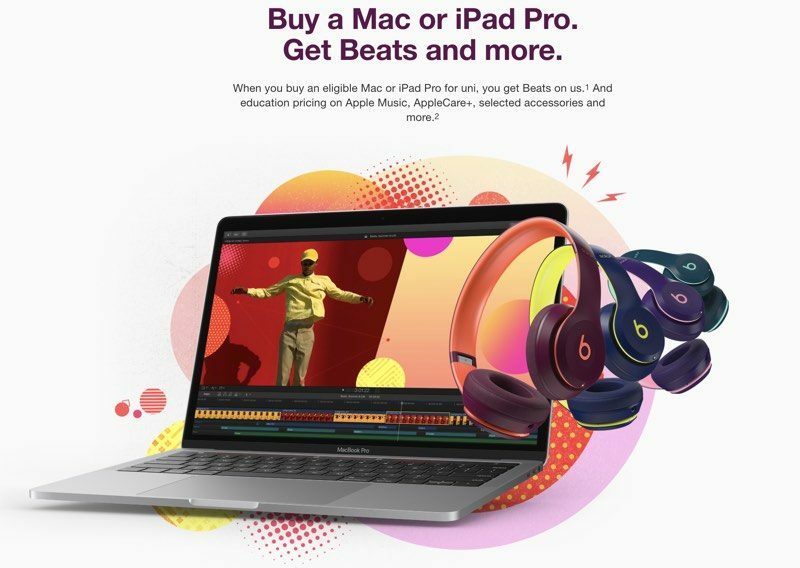 With the purchase of an eligible Mac, which includes the MacBook Air, MacBook Pro, iMac, MacBook, Mac Pro, and iMac Pro, students can get a free set of Beats Solo3 headphones, or Powerbeats3 headphones. Studio3 headphones are also available at a discounted price of NZ$40.00 in New Zealand, A$50.00 in Australia, and R$ 350,00 in Brazil. With the purchase of a 2018 iPad Pro, Apple is providing a free set of Powerbeats3 earphones. Beats Solo3 headphones are available at a discounted price of A$140.00, NZ$160.00, or R$ 700,00, while Beats Studio3 headphones are available at a discounted price of A$190.00, NZ$200.00, or R$ 1.050,00. The promotion includes Apple's newest "Pop" PowerBeats3 and "Skyline" Studio3 lines. Both the Macs and the iPad Pro models are available at a discounted educational price when purchasing through the Australia, New Zealand, and Brazil educational stores, with discounts of up to A$290, NZ$340, or R$1.760,00 on qualifying Macs. The education stores also offer AppleCare+ protection plans at a 20 percent discount. For further discounts, as pointed out by 9to5Mac Apple is promoting its trade-in program, which allows older devices to be traded in for credit towards new devices. Apple has been heavily promoting trade-in options as of late, especially for the most recent iPhone lineup. To get the free or discounted Beats, students simply need to add an eligible Mac or iPad Pro to their carts, where the option to add the headphones will come up automatically. Discounts are available for current and newly accepted university students, parents buying for students, and teachers and staff at all levels. Sign up and enrollment verification through UNiDays is required. Educational discounts in Australia, New Zealand, and Brazil will be available for a limited amount of time, both online and at Apple retail stores in Australia and Brazil. The promotion is set to end on March 15, 2019, with terms and conditions available in PDF form here: Australia, New Zealand, and Brazil. Apple's back to university promotion in Australia and New Zealand is the same as the Back to School promotion that Apple launched in the United States, Canada, Mexico, and several European countries back in July. Update: The Back to University promotion is also available in South Korea. I suspect a normal price reduction for students would be more helpful. Because why would they discount their machines by another 300$ when they can give you headphones for the fraction of the cost to them? Why wouldn’t they push their own brand to make others then buy those same headphones?? You do realize apple owns beats headphones? Nope. Students fundamentally spend other people's money: parents, loans, scholarship... They don't benefit directly from a price drop, but they benefit from free stuff. Why they don't just have a cut the price promo instead? Overstock on the beats to get rid of? Hmm, deal ends March 15. What are the odds Apple will release a new iMac on March 16? As I just buy a MacBook Pro 15" 2018 in the states 3 days ago....Id love to have a pair of those. Don't care what the haters say, they are good quality headphones. There's never been a better time to buy into iPad Pro. It is the ultimate supercomputer. Who cares if they spend other peoples money? If you don't have to spend X money on A, you have more left to buy B even if that B is beer. They therefore benefit from the price drop. My guess is Tim is having a hard time with PRICES... we used to pay for Apples unique ability, that gap has closed significantly and justifying the cost is getting harder and harder. Does iOS's Safari open webpage in desktop site format every single time? I can still run into the damn thing opening mobile version of the site even I have requested the desktop version.